One of the frustrating things about ending up in New Mexico was the altitude issue when applied to cooking. I tried altering the recipe utilizing the instructions for high altitude in my Reference for All Things Cooking, but to no avail. They kept coming out sort of brick-like and refused to rise at all. As hockey pucks are not things one wants to cover with gravy or fruit or butter and honey and consume… we had to rely on purchased biscuits for quite some time. This probably troubled me more than it should have, but when I can, I really prefer to make my own baked goods. Back when my bodyshell was more functional, I even baked all of our bread, but that ended up being too time consuming. Homemade bread disappears far more swiftly than even the best standard grocery bread. There’s only so many loaves one can make in a week. One particular day, years ago, we were perusing the sale section at a bookstore. Probably one of the ones that has gone out of business since – Hastings, Borders, possibly Barnes and Noble? I do not recall the location, exactly, just the piles upon piles of “we want to get rid of these” books. At the time books were a rarity and a luxury. There were a thing we saved for. New releases by favourite authors required time and planning and sacrifice. From our perspective, there was a lot of chaff in those sorts of piles, but one does occasionally find some gems hidden in the confusing melange. This particular outing I found one that was fascinating to me. And it surprised me that it was fascinating. I love music, but country and I have never really connected particularly well. I like old blues, I like some of the older more blues than country country, and there are a few songs and a couple artists that I enjoy… but it has never been one of my genres. The book was called “Music in the Kitchen” – and it was a compilation of the favourite recipes of a long list of artists – most of them country – most of them people I had never heard of. I was torn. And a bit weirded by my interest. Among other things, I knew I would feel the need to listen to the music of the people I’d not heard of prior. It would seem rude to utilize a recipe without having given the respect of experiencing their art. Mister Tea ended up making the decision. “You’re curious enough about it to have lugged it around the entire time we’ve been wandering, and I want proper red beans and rice.” Not a direct quote, but the gist is definitely there. We brought the book home. I started reading recipes, listening to music, and testing things. … I found some truly delicious food. And the best of the discovered recipes was one for biscuits. Unfortunately that particular recipe book is currently in a box in the garage somewhere, so I cannot pull up all of the specifics for you, but the artist was Toni Price. Knead for a minute. Or until you’ve worked the flour in. Don’t overwork the dough, as it can make the biscuits uncomfortably chewy. This is one of those “just until mixed” scenarios. Pat, pull, roll – whatever most amuses you – into a square ½ inch thick. I tend to approach it sort of like play-dough. Pulling and stretching and tugging and smooshing and smoothing and… giggling, often, as I work the dough into the right shape and size. Cut into however many biscuits of whatever size and shape you desire. I use kitchen shears3, and my biscuits are always a somewhat motley array. It may be odd, but I prefer a bit of chaos in my biscuits and cookies. They always end up with… character. You can use a knife, but the dough is kind of sticky, and you may end up with more of a mess than anyone wants to clean up. These do not actually expand much, so you can place them more closely on the baking sheet than you might expect. They mostly expand up, rather than out. Bake for 12-20 minutes. I start with 12, and then check every couple minutes until they look like proper biscuits. If you apply a more regular approach to your biscuit size and shape, you may be able to go with the straight fifteen the recipe originally called for. By the time I remembered I wanted photos, we’d eaten most of them. However, this does give an idea of how randomly I approach size and shape. Honestly, most of the time we fail that check, but they are still brilliant, even without proper cooling time. So, here is my go-to biscuit recipe and process. I hope it turns out to be as useful for someone else as it has been for me. 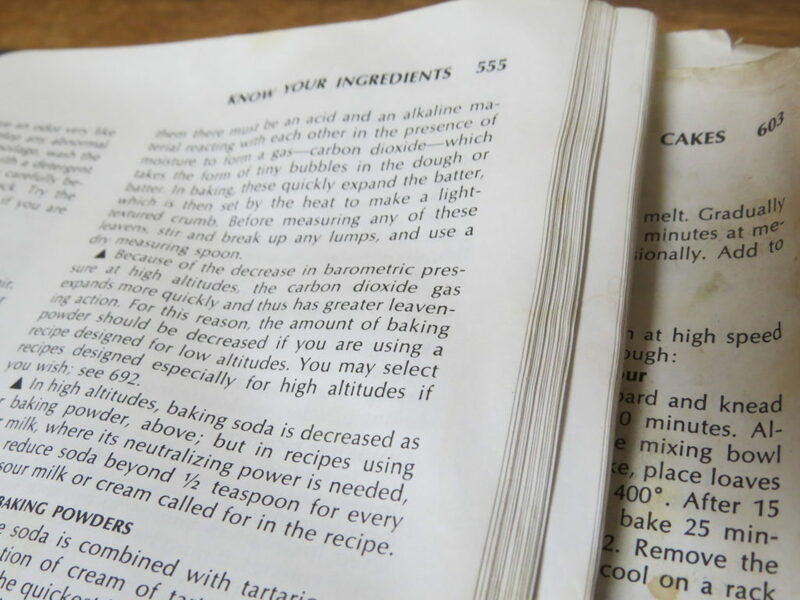 It was also not the only good recipe I found in the pages of “Music in the Kitchen” – so if you collect cookbooks, I definitely recommend it. 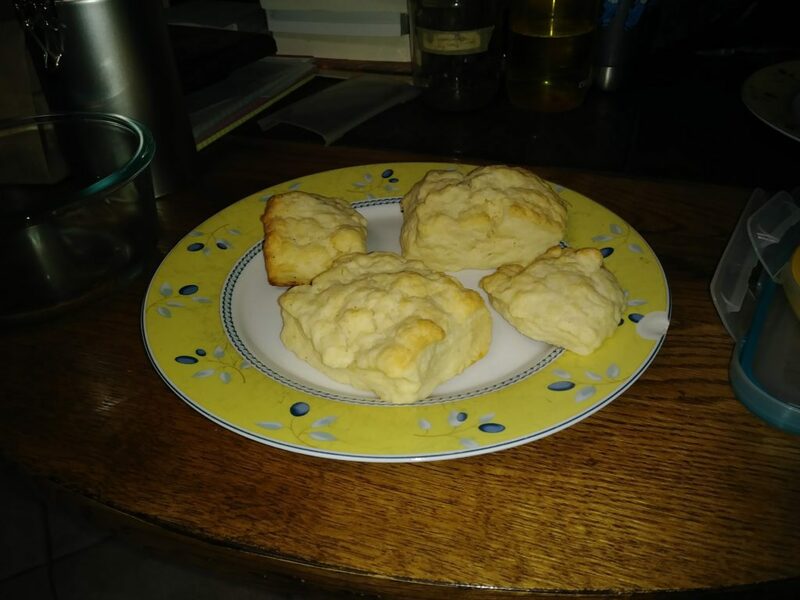 The first biscuit recipe I found that worked properly at high altitude. Combine dry ingredients. Slowly add cream, while stirring. Knead for a minute - or a little longer if needed. Turn dough into 1/2 inch square. Bake 12-15 minutes, or until they look right via your preference. 5,312 feet. It has been postulated that Albuquerque, also, should be called a Mile High City. Living in the nosebleed section does have its benefits, though. A few years back, my parents took us to Disney World, and we felt invincible! So. Much. Oxygen. Our most recent attempt at these I finally remembered we had a stand mixer. And used it. Wow. They ARE far more useful than your average kitchen gadget. Thank you, homepunks, for reminding me of it in your bagel recipe. Kitchen shears are amazing. A good pair is one of my recommended make-sure-you-have-a-good-pair kitchen objects. The level of easier dealing with raw chicken is with them was life-changing in and of itself, and it is far from their only utility. This entry was posted in Adventures in Cooking and tagged Adventures in Cooking, anytime food, Biscuits, books, breakfast food, Desert Sage, Music, posts with audio by DesertSage. Bookmark the permalink.